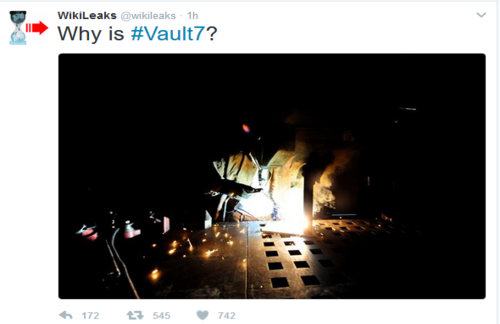 HomeConspiracyMysterious Wikileaks Tweets Are Melting Down The Internet – What Is ‘Vault 7’ And Why Has It Suddenly Gone Viral? 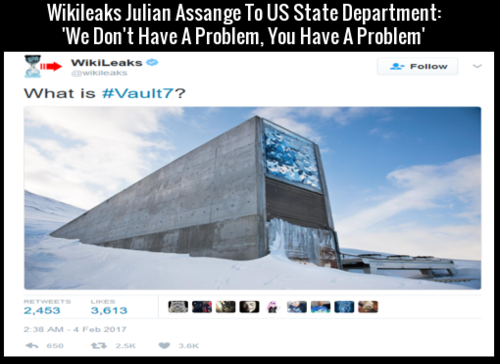 Beginning on February 4th at 5:38 a.m., Wikileaks put out a tweet that simply asked “What Is #Vault7” within which they featured a photograph of the Svalbard Seed Vault lying in the snow on the Norwegian island of Spitsbergen as seen at the top of this story. Each day since then, Wikileaks has released another mysterious and cryptic tweet. The Svalbard Seed Vault by the way is the biggest ‘doomsday seed vault’ in the world, holding more than 500,000 different samples in what is also considered the most diverse seed vault in the world. Interestingly, the tweets released by Wikileaks also followed the “Five W’s” often used in investigative journalism and police investigations. According to the principle of the Five Ws, a report can only be considered complete if it answers these questions starting with an interrogative word. What? Who? Where? When? And Why? 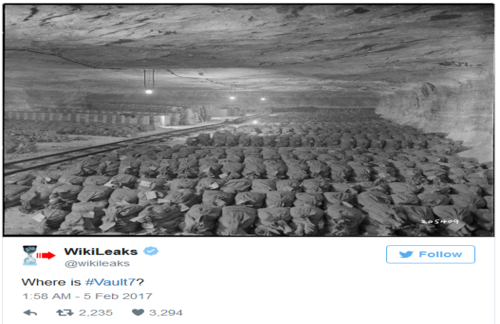 On February 5th at 1:58 a.m. Wikileaks put out another tweet which simply asked “Where Is #Vault7” which contained the photograph seen above of a Nazi gold stored in the Merkers Salt Mine, discovered by the US Army in 1945. According to the National Archives, the mine contained gold bullion, gold Reichsmarks, British gold pounds, French gold francs, American gold pieces, gold and silver coins, additional foreign currency, silver bars, platinum bars, artwork, and more. 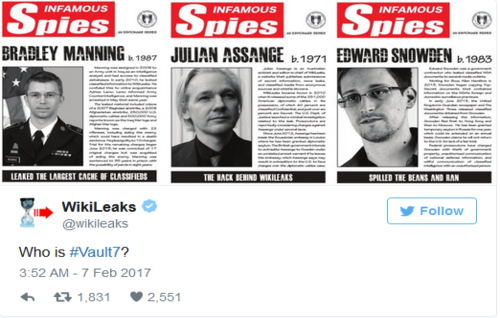 On February 7th at 3:52 a.m. Wikileaks put out a tweet asking “Who Is #Vault7” showing photographs of ‘3 infamous spies’, Bradley Manning, Julian Assange and Edward Snowden, within posters made up of them by the US government. With the ‘Infamous Spies’ headlines looking almost like the headlines of some ridiculous tabloid newspapers, might ‘Vault 7’ refer to upcoming bombshell Wikileaks revelations which they’ve promised to bring us in 2017? As Mother Nature’s resources naturally break down with time, so does the infrastructure on base. Buildings age, pipes wear down and other vital assets require replacement. What are all of these cryptic and mysterious Wikileaks tweets about? 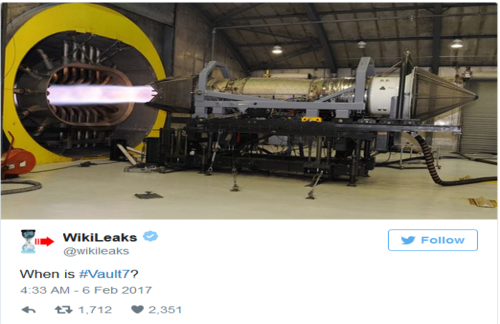 Back on February 1st, only days prior to the beginning of the cryptic tweets, Wikileaks released the tweet seen below teasing a pending publication and an ‘insurance file‘. So, what does Wikileaks know that we don’t know? Several new videos below take a look at ‘Vault 7’ and what these mysterious tweets put out by Wikileaks this week might mean. We also should remember that back on December 31st of 2016, Wikileaks put out a tweet which stated: “If you thought 2016 was a big WikiLeaks year 2017 will blow you away. Help us prepare for the showdown.” What ‘showdown’ was Wikileaks referring to? And, is America about to get another massive dose of truth? 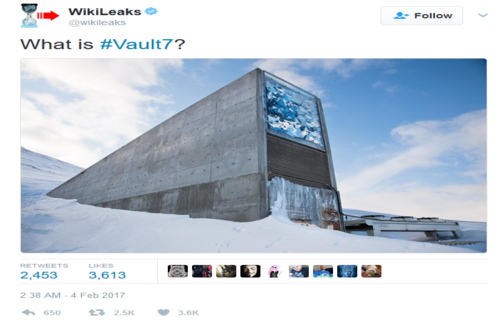 What do you think ‘Vault 7’ is all about? The theories explored within these videos include ‘Vault 7’ might have something to do with the FBI’s ‘Hillary Clinton emails’ as on February 4th, soon before Wikileaks first cryptic tweet came out, they also tweeted “Full Text: FBI Quietly Releases Part 6 Of Its Hillary Clinton Investigation” while linking to a PDF ‘coincidentally’ being held at this website address: https://vault.fbi.gov/hillary-r.-clinton/hillary-r.-clinton-part-06-of-06/at_download/file. Is ‘Vault 7’ the next part of the Hillary Clinton emails, ‘Vault 6’ having already been released? Others believe that Vault 7 might have something to do with what happened on 9/11 and the mysterious ‘building #7’ that collapsed to the ground that day without being hit by a plane like the other two WTC buildings. The video ends with “it’s time,” an echoed term that has previously been tweeted by Snowden as well. The group’s riddle, “the answer is there right in front of you, if you know the alphabet Google is your friend.. or maybe not.” You can see that video of the phone call made to the US State Dept as the final video below, a video within which AnonScan make a mysterious reference to February 19th. What’s supposed to happen on February 19th? Interestingly, in the phone call that Assange made to the US State Department in 2011 he stated “I’ll try to make this clear….we don’t have a problem…you have a problem.” So what does Wikileaks know that the American people don’t know and why is February 19th of ‘great importance’ to AnonScan, who made the video seen within it? According to another theory floating around on Reddit as seen in the screenshot above, these tweets represent an ‘insurance policy’ and an attempt to let somebody know that ‘they have the goods’ about something, possibly having to do with the events of 9/11 or the still-missing Hillary Clinton emails. Each of the videos below take a look at what ‘Vault 7’ might be and in closing, we find it quite interesting though not surprising that in doing a search for ‘Vault 7’, not even one mainstream news media source showed up as covering it. Is the MSM ‘blacking out’ Vault 7 for one reason or another? This story will certainly be continued as more info is released in the days and weeks ahead. Wikileaks ‘Vault7 Rabbit Hole’ Gets Even Deeper! Are They Preparing To Bring Down ‘Ringleader’ George Soros?